My name is Bernadette Hoffman and this is my passionate hobby! 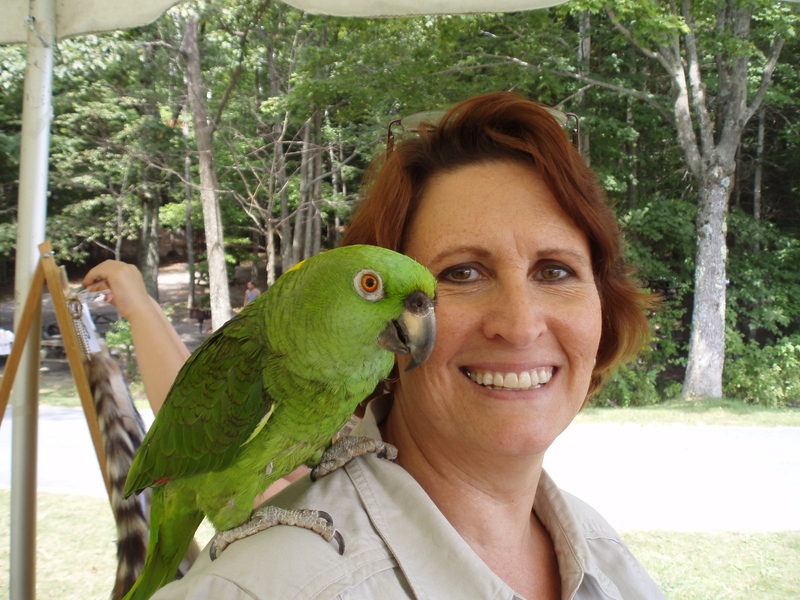 I bring wildlife education to libraries, schools, youth and senior organizations, festivals, and even birthday parties. I believe that children learn best when they can touch, hold and investigate things. Children, who have experienced the joy of kind and gentle interaction with animals, are more likely to become adults who care about protecting wildlife. My animals are common exotics but the kind that many don’t possess. Children are captivated by them and are excited to touch these animals, and learn about the wild animal specimens I present. My animal artifacts are unique in that most will never get to touch its live counterpart. Such as zebra, caribou, kangaroo, skunk and many more species. It’s fun, educational and interactive. I provide biology, interesting facts and stories from my zookeeping experience. I also have taped sounds of various animals. Discover some unusual animal voices! Education of our next generation is the only hope for the survival of our endangered and threatened animals. It is the only hope for the survival of all species. We need to teach children that there’s a huge natural world beyond their computer, television and backyards! Often I hear “wild animals belong in the wild.” But what happens when there is no “wild” left? As habitats rapidly disappear due to agricultural and urban expansion, wild animals are being pushed closer to the brink. When the wild is gone, there are two options: captivity or extinction. Let’s save the wild! It’s wonderful that we offer exciting programs to children in the summer months, but it shouldn’t end there. I’m available year-round, weather permitting. I would love to share my program with you! I was zookeeper for six years (2002-2008) at Flag Acres Zoo in Hoosick Falls, NY. I cared for 150-200 animals (40+ species) while teaching college interns in exotic animal husbandry. I gave educational zoo tours & presented offsite programs. After twenty-one years in operation the owners retired and the zoo closed in the fall of 2007. Slowly through the winter I helped them deliver our beloved animals to other zoo homes until the last left in May 2008. I became a part-time museum educator for the Pember Museum of Natural History located in Granville, NY in May 2008 and moved to full-time 2015. This wonderful 100+ year old victorian museum of wildlife and natural items from all over the world was founded by one man. Come visit us! www.thepember.com. I have moved my blog archives (Sep 2011-Nov 2013) to http://www.Wildlifebernie.wordpress.com. You can also click on the name under Blogroll. Scientists believe that humanity’s destruction of the biosphere could cause the extinction of one-half of all species in the next 100 years.